The following comments about attractions in Houston have been posted from individuals. We believe that the best reviews of Houston, Texas (TX), TX USA are written by travelers and holiday makers who have experienced Houston first hand and want to share their thoughts. Can you share yours? Please help us expand this section of our Houston World Guide. 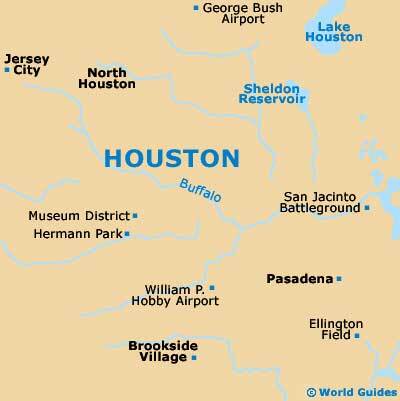 Let us know what you think about the attractions in Houston, Texas (TX) USA. Submit comments about Houston attractions here. Rice University is just a few kilometers to the south of central Houston and is really near to the Texas Medical Center and the Museum District, and right next to Hermann Park. It has around 5,000 students and a really good trail for jogging. The central McGovern Lake in the park is a nice touch and if you like, you can hire a paddleboat here. You might also like to catch a shoe at the Miller Outdoor Theatre, especially as they are free. The zoo is also located in the park, along with rides on a miniature train. If you can and time it right, do go horse racing at Sam Houston Race Park. I loved it when I went, although I didn't really win much, but it was a good experience. If you can afford it, try and sit in the restaurant in the Winner's Circle. The views are great and the buffet is usually nice. Please note that these Houston, Texas (TX), TX USA comments and reviews are posted by individuals and are not necessarily the views of World Guides.